In the past braces were designed to be effective rather than attractive and that was a problem for many adult patients and some children. Today there are more attractive orthodontic options and advances in orthodontic technology have produced orthodontic braces that are more appealing to patients. New orthodontic appliances are more comfortable, easier to keep clean and work more efficiently than older braces. Invisalign is a great technique to correct minor tooth alignment problems. If you want a cosmetic improvement of your smile without having to wear a traditional brace Invisalign may be a solution for you. What types of case are suitable for Invisalign? 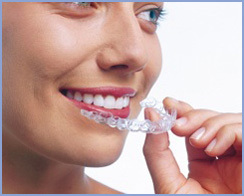 Invisalign is great at correcting minor tooth irregularity. On the whole, although there are exceptions, it is suitable for non-extraction treatments with a mild degree of crowding. 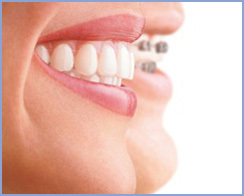 Invisalign treatment involves wearing a series or removable aligners. Detailed impressions of your teeth are taken and sent to Invisalign for aligner construction. Each aligner is worn for two weeks and then you replace your current aligner with the next one in the series. Each aligner progressively moves your teeth until your teeth are straightened. Depending on the severity of your problem, you may be given between 10-50 aligners. Often before wearing your first aligner small tooth coloured attachments are glued onto your teeth. These are needed to help the aligners do their job. You will return to see us every 6-8 weeks and sometimes small amounts of tooth enamel will need removed between your teeth to create space to allow your teeth to move Sometimes during treatment new impressions are needed to fabricate more aligners, this is to a opportunity for Invisalign to review your progress and make recommendations to finish your treatment to get the best results. Tooth coloured ceramic brackets are the most popular way to get a great smile with a labially positioned fixed appliances. They are suitable for both extraction and non-extraction orthodontic treatments. Newer ceramic brackets have a self-closing clip which means treatment is more efficient and they don’t pick up food and drink discolouration as easily as older designs.